Lately there has been a resurgence of classic cocktails. They've slowly taken over bar menus across Toronto, edging us away from fruity martinis (bye-bye Cosmos) towards bourbons, whiskeys, and bitters. Personally I know very little about classic cocktails, so on Sunday night J and I headed to The Thompson Hotel’s Lobby Bar to get a lesson from our friend Ryan. Ryan has been bartending for the last few years, slinging pints and mixing drinks at various locales across the city. For me, there was no better person to shed a little light. We started our evening off with a Moscow Mule, a vodka based cocktail. This refreshing drink had a slight citrus taste, a hint of sweetness, and a sparkling, crisp finish. To make mix 1 ½ oz of Belvedere vodka, 1 oz freshly squeezed lemon juice, and ¾ oz of simple syrup. Shake and strain the ingredients into a highball glass over ice and top with ginger beer. Using a bar spoon add a float of Pernod and garnish with a twist. 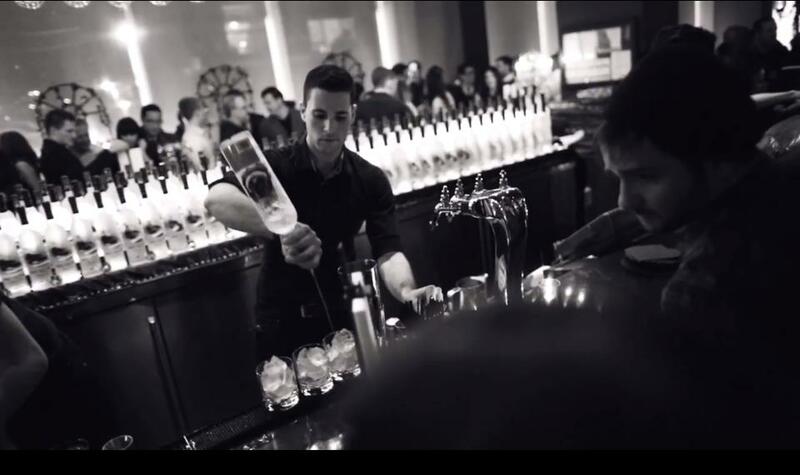 Ryan specifically uses Belvedere in this cocktail because it enhances the character, body and finish of the drink thanks to its aromas, smooth texture and clean finish. Next, we sampled a variation of a Rusty Nail called Ryan’s Rusty Nail. This well rounded cocktail was slightly sweet and stronger then the first – I described it as boozy – with a clean finish and a taste of orange that lingered slightly on the tongue. Begin by covering the bottom of a rocks glass with orange peels. Add 1 ¼ oz of Johnnie Walker Black, ¾ oz of Drambuie, ¼ oz of Galliano, 4 dashes of Regan’s Orange Bitters and stir. Top with ice and garnish with an orange twist. Ryan explained that the mild peat of the Johnnie Walker Black brings out the whiskey flavours in the Drambuie. He suggested that the Johnnie Walker Black could be substituted with Laphroaig Islay single malt scotch whiskey, which has a smokier peat. Ryan also noted that, in his opinion, Drambuie is an underused, underrated ingredient that really should be present in more cocktails. Finally, we sampled an Old Fashioned. On first taste this cocktail had a slight bite and bitter character, but it grew increasingly sweeter and aromatic as I neared the end. Begin by placing orange peels at the bottom of a rocks glass. Add a bar spoon of granulated sugar – Ryan explained that using simple syrup would water down the cocktail. To melt the sugar add 7 or 8 dashes of Angostura bitters. Next, add a splash of club soda and a maraschino cherry, and muddle. Add 1 oz bourbon, 4 or 5 ice cubes and stir. Top the drink off with another ounce of bourbon, and garnish with an orange twist and maraschino cherry.